This week I’d be flying solo to Cardiff, landing, and coming back. Cardiff has full ATC and is within a Class D CTR , unlike Shobdon, making it a more complex approach. The sun was out, the sky clear and I arrived at the airfield nice and early to prepare. NOTAMs checked, Royal Flights checked, MET checked, weight & balance checked, fuel planning done, A-Check checked – everything checked! After a briefing from my instructor and some more paperwork (signing my life away, that sort of thing) I was in the aircraft on the apron, ready to taxi. After a short taxi and hold, I was cleared for take-off and soon climbing out of Gloucester’s runway 22. Quite an ideal runway considering my destination, I barely had to change track to get to the magnetic heading I’d planned on my PLOG. As is usual departing Gloucester, shortly after departure Tower hands you to Approach, who provide a basic service and give you a reporting point. Usually when heading this way they ask you to report “at the bends” which means at the bends in the river – about 10nm from the airfield. Today was no exception. After a top-of-climb FREDA check I did a quick gross-error check by comparing my expected position on the chart with what I could see, and everything was looking good. To be fair, it’s fairly hard to get lost on this route as you basically hug the shoreline the entire way. After a few minutes I was at the bends and reporting to Gloucester Approach, who then suggest I freecall Cardiff. Before leaving, I obtained the Regional Pressure Setting (Cotswold) so that I can adjust my altimiter. When a radio change is prefixed with Freecall, it means that the current station have not passed your details to the next station, therefore you are calling them of your own free will. This is therefore not an instruction. Clearly, in this instance it makes perfect sense for me to talk to them, so I say goodbye to Gloucester and obtain Cardiff’s ATIS. After noting down the ATIS information, I call Cardiff Approach. Their ATIS announcement says to report your aircraft type on first contact, and I forgot, but they didn’t seem to mind this time. Maybe they were going easy with me as I was a student? After their “pass your details” request I launch in to the full CARPACER call. Shortly after they give me a Squawk for the transponder. I had noticed in the aircraft’s techlog that the previous pilot had noted ‘possible faulty transponder’ so I was unsure whether it would actually work or not (there was some debate in the office as to whether or not said person had actually had the thing switched on). After a minute or so, Cardiff ask me to check the Squawk so I tell them I think it’s faulty. No problem, I’m given a basic service and tell them my position so they can identify me manually on their radar. Runway 30 was in use, the opposite to what I had used when I flew here with my instructor. Landing at runway 30 involves flying along the coast and then turning right to approach the runway from over the sea (it’s right on the cliff edge). I’d been told by Tower to join right base, so as I start to position to join the circuit I do my pre-lander checks BUMFFFICHL. As I turn on to final, I hear a Thomson commercial airliner flight given take-off clearance and I’m asked to orbit. Well, that’s a new one for me. Being told to orbit when you’re at 700ft on final approach (‘low and slow’). Nothing like something new to keep you on your toes! So I increased power, climbed a little and made a right orbit over Barry Island. After ending my orbit and reporting final, I didn’t have much time to get the approach speed and attitude right, but luckily as Cardiff’s runway is so massively long I didn’t need to worry too much about landing on the numbers. At about 1nm on final, I’m given traffic information that a Cessna is passing behind me, routing around the coast. Bit distracting as it got me looking for the traffic, but I suppose I need to get better at multi-tasking. The landing was fairly uneventful, and I was soon parked on the south apron outside Aeros, and – more importantly – the airport pub/cafe. The cafe was busy and had a 1.5 hour wait for food, so I had a quick diet coke and headed back out for the return leg. After doing the usual checks, I was on the radio to Cardiff Tower asking for permission to taxi. The return flight back to Gloucester was very straightforward, with an exit via the VFR Wenvoe route (to the East of the mast, near Cardiff Docks), followed by handover to Gloucester Approach who cleared me for an overhead join. The landing was smooth and I headed back to Aeros for a debrief (and coffee!) with my instructor. Several weeks of bad weather had passed since my previous lesson (in which I flew with my instructor to Shobdon) but finally this Saturday it cleared up and I was able to fly the route solo. After creating the PLOG, calculating weight and balance & fuel, checking NOTAMs, weather and plotting the route on the chart, my instructor reviewed everything and we filled out some paperwork. All ok, so I headed out to the aircraft and did the A-check. Everything was fine, so I was good to go. First, I needed to get some fuel, so I taxied to the pumps. 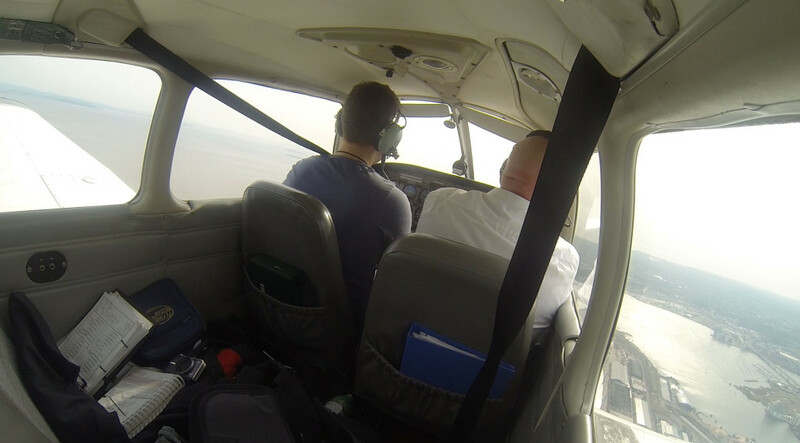 My instructor met me at the pumps, then I was back in the plane – alone. So, go through the checklist and request permission to taxi. When flying solo, you need to prefix your callsign with STUDENT when making your first radio call to each station. It doesn’t hurt to say it in subsequent calls, and I am of the opinion that I’d rather keep saying it (especially when on approach) to make everyone aware that I’m a student and I’d like to hope they might be a little more forgiving and/or cautious! Without much waiting around, I was cleared for take-off and climbing up from runway 27. A small turn to the right for noise abatement, then I turned on to my heading from the PLOG. So far so good. People on the radio were feeding back reports of gliding and parachutists around the Malverns, so I was paying extra special attention in my lookout in that direction. I didn’t see anything though. Not sure if that means I was being blind or whether they were further away from my track than I first thought. The journey proceeded as planned, it was fairly uneventful. At Ledbury, I changed frequency to Shobdon Radio and obtained the joining instructions. Runway 27 was active with left hand circuits. Gliding in progress (they use the grass runway) and have a lower circuit height. After passing Hereford and crossing over the Cotswold ASR boundary, I switched to Barnsley’s QNH (which I obtained from Gloucester before leaving them). Soon enough the airfield was in sight. I still find it a little funny listening to Shobdon on the radio, as being an Air/Ground or FISO it’s less controlled than the ATC at Gloucester and some of the transmissions seem a little verbose at times. I’m glad I am learning at an airport with ATC, as I’m sure it’d be harder to learn with an A/G and then get used to the formalities of ATC. The circuit at Shobdon was pretty busy, with lots of radio activity. I made an overhead join and had one aircraft ahead of me. Shobdon Radio did a great job of asking the aircraft ahead of me to expedite their exit from the runway, they really went out of their way to make my experience as straight forward as possible (I guess they were trying to avoid me having to go-around). After landing, I taxied to the grass parking area, and went to the cafe to get some fresh air and a rather nice hotdog and chips! I met quite a few people in the cafe, including a nice chap who is based at Shobdon who has a share in a microlight. He had never landed at Gloucester so I encouraged him to do so – especially as he had the same microlights as they use at the Flying Shack. After lunch, I waited around a while. There was a planned airshow display near Gloucester (I saw this in a NOTAM) so I had to time my arrival at Gloucester to be after the airshow had finished. Soon enough, it was time to leave, so I headed back to the plane and worked my way through the checklist. The flight back to Gloucester was again fairly uneventful (thankfully), so after landing it was back to Aeros for a well-deserved coffee and debrief with my instructor. I had the entire afternoon booked out today, so we could get lots of flying done. I needed to practice flight in IMC (not because I’d be allowed to fly IMC with my initial licence, but as training incase one inadvertantly enters IMC and needs to get out..fast). IMC is short for Instrument Meteorological Conditions and is basically when you do not have sufficient visibility to fly visually, such as flying in cloud, fog or strong haze. In the pre-flight briefing, we talked about the the ‘six pack’ instruments – the basic six instruments in pretty much every plane. They’re arranged in two rows of three, so three on the top row and three on the bottom. Can you name each one? I managed 5 out of 6 and got stuck trying to think of the last one. It’s much harder than it sounds! When flying in IMC, it’s essential that you scan the instruments according to a defined order. The main instruments are in a T shape (airspeed indicator, artificial horizon, altimeter on the top row, followed by the direction indicator on the bottom). Even flying straight and level (which is pretty easy in VMC) is very demanding when flying in IMC. This is because you need to scan the T every second. Yes, every one second. Are we flying straight? Lets check the DI. Check the AI. Check the DI again. Still the same? Yes. Good, straight. Are we flying level? Check the altimeter. Check the AI. Check the altimeter. Still the same? Yes. Good, level. Every time you look at an instrument that isn’t the AI, you should immediately look at the AI next. You can see how the workload ramps up very quickly in IMC. Doing a FREDA check whilst incorporating your T scan suddenly makes things much more difficult. Add in a radio call and you can see how things can go wrong very quickly if you’re not well prepared. When turning in IMC, turns are normally conducted as a rate one turn. A rate one turn means that it takes one minute for the aircraft to turn 180 degrees. It therefore follows that turning a full 360 degrees (an orbit) will take two minutes. The turn co-ordinator (bottom left in the six pack) has markings on the left and right which – when aligned with the aircraft wing – means you are doing a rate one turn. If you inadvertently enter IMC, the first thing to do is check the MSA for your current position. If you’re below it, climb pretty quickly. Clearly as a basic PPL, you’re not qualified to be in IMC anyway so if you do fly in to a cloud then you should do a rate one turn for one minute (eg 180 degrees) to head back out of the cloud. Finally in our pre-brief we talked about the SRA. Whilst not part of the PPL syllabus, my instructor suggested we do one anyway as it’s good experience. Whilst flying IMC there are various methods available to approach and land at an airfield. The exact methods available will depend on the airfield and your licence, but could include an NDB approach, ILS approach, radar vectored approach, etc. An SRA is one of the simpler approaches and is likely to be used if you do inadvertently enter IMC and need help from ATC to get down. Essentially, the tower uses radar to identify your position and then issues instructions for you to change heading to align yourself for the approach. Each SRA has defined minimums and the one we’d be flying would take us to 2nm from the runway threshold. Some go down to 500metres (or less). We headed out to the aircraft and did the usual pre-flight checks. We were soon up in the air and my instructor put up the instrument screens. These basically block the pilot’s view – I couldn’t see out the windscreen or the left window, effectively simulating IMC conditions. 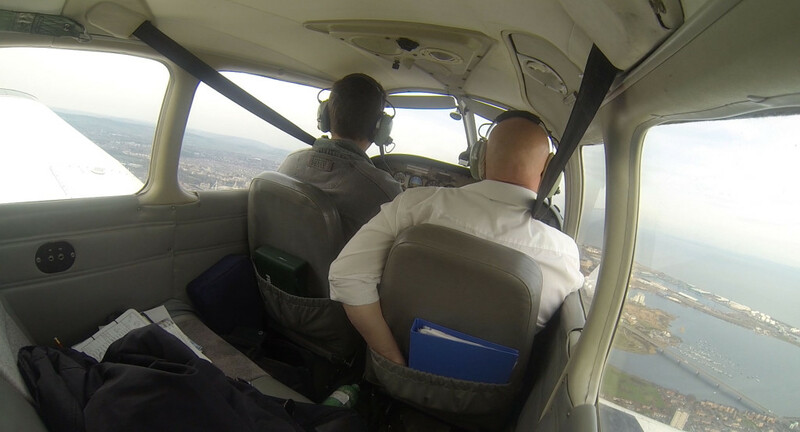 The instructor’s view is unobstructed so he acts as safety pilot maintaining good lookout during the training. I practiced flying straight and level, through reference of the instruments. It’s certainly more involved than it sounds, but after a while I got the hang of it. Felt a bit like using a flight sim as you’re fixed on the instruments. 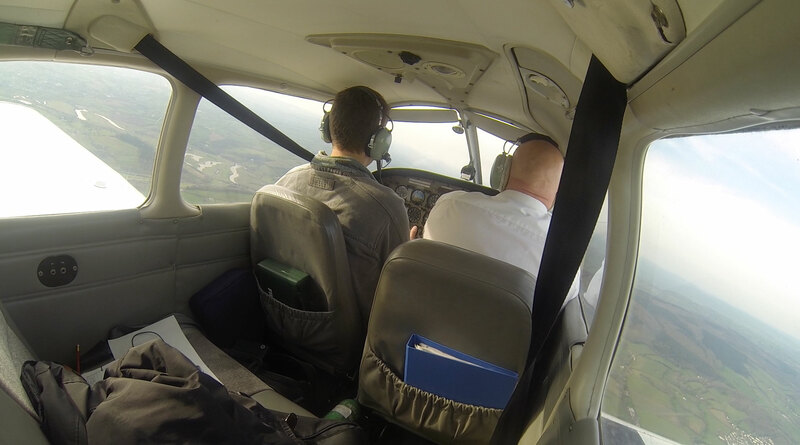 We then did some rate one turns, which seemed fairly straight forward – make sure the turn indicator is on the right notch and make sure you are flying level and everything’s cool. After a bit more flying with the screens up, they came down and I headed towards the approach for Shobdon airfield. Shobdon has a non-standard join procedure, which involves descending not below 1500ft on the deadside, and then descending to circuit-height (1000ft) on the live side, to join the circuit mid-way downwind. I got a little confused at first but soon got myself sorted out and everything went well. We landed, taxied to the grass parking area (remembering to change between surfaces at 45degrees) and headed to the cafe and paying the landing fee. A while later, we booked out and prepared for departure. We were soon up and away, and heading back towards Gloucester. Up went the IMC screens again and I did some more rate one turns, climbing, descending and straight and level. The instructor spoke with ATC and requested an SRA for runway 09 which was accepted. Firstly, they needed to identify our plane on their radar. (Gloucester don’t have secondary surveilance radar, which interrogates the transponder and enables you to use a unique sqwawk) so to identify you they ask you to turn a specific heading. We obliged and a few seconds later, they told us we had been identified. We were then given a series of instructions “turn right heading 170” and information “you are 9 miles from the threshold at 2000ft” and as we followed their instructions our track was nicely aligned for a long final approach. At 2nm the instructor took down the screens, the SRA service was terminated, and – sure enough – I was staring at the runway straight ahead – magic! Annoyingly my GoPro memory card filled up before we did the SRA, otherwise I would have uploaded the video as it was quite a cool experience. I’ll try and do another one and upload it in the future. 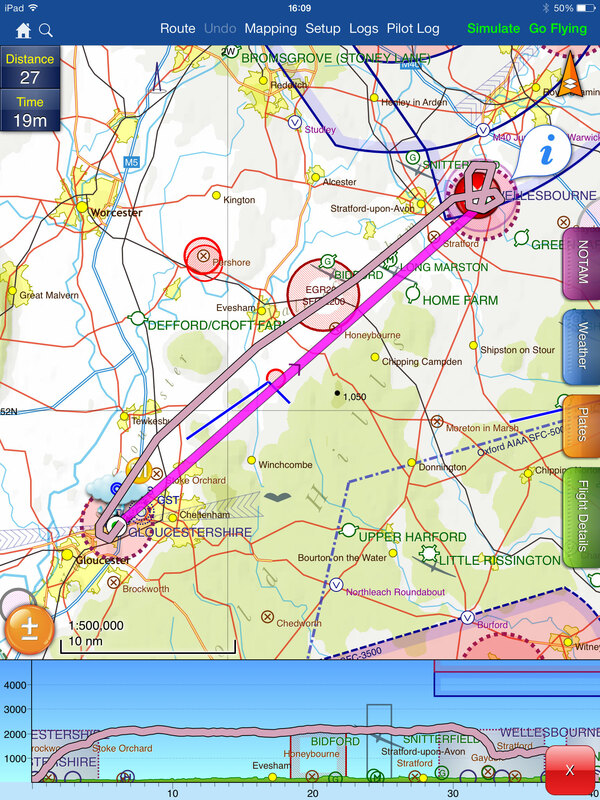 The weather wasn’t looking too great to the East, but to the West was looking good so my instructor told me to plan our route from Gloucester to Cardiff. It’s about as easy as they come to navigate along the direct route, as you hug the line of the Severn River all the way down to Cardiff Docks. Cardiff airport is in a Class D Control Zone (CTR) and is surrounded by Control Areas (CTAs) at various heights. These are designed to protect the commercial traffic heading in and out of the airport. I had to read up on the visual entry procedures (in the AIP, my AFE guide and also – I found most helpfully – the Cardiff VFR Guide). 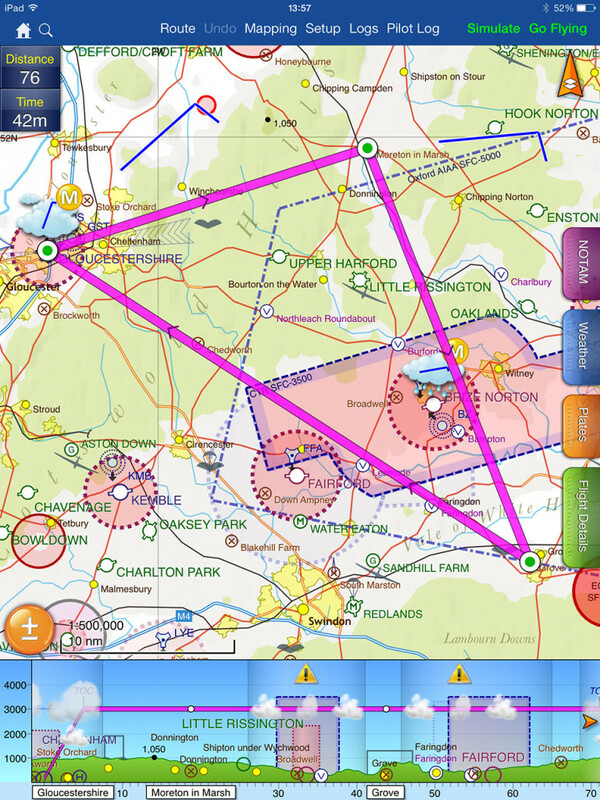 All VFR clearances within Cardiff’s airspace is not above altitude 1,500 (on Cardiff’s QNH). Approaching from the North East, we could expect to receive clearance via the Published VFR Cardiff Docks route, which means entering the CAS via Cardiff Docks and then doing whatever you’re told to do by Cardiff on the radio. PLOG complete, with an estimated flight time of 30 minutes to Cardiff, NOTAMs checked, temporary airspace/royal flights/air force checked, we were almost ready to go. My instructor phoned Cardiff and booked us in (although they did say to him that PPR isn’t required, which is the opposite of what’s said in the AFE book! ), we booked out with Gloucester and headed to the plane. We needed fuel, so after checking the oil and a quick visual inspection (it had already been A-checked earlier in the day) we were requesting taxy to the pumps. Fuel filled up, ATIS checked and I requested taxy. It was a busy day at Gloucester, the radio chatter was non-stop and we were holding for around 20 minutes. During this time 3 planes landed and 1 ahead of us took off. Finally it was our turn. I was given a “line up and wait behind the landing” clearance, so I was paying close attention to the landing plane and started to roll to the runaway as it passed us. Lined-up, ready to go. I had re-aligned the DI to the compass twice already and we hadn’t even taken off. Whilst lined up on the runway I did another check and again noticed it had drifted 5 degrees off. I keep making the mistake of mis-reading the compass. The problem is that the compass direction is opposite to the direction on the DI (and common sense). For example, the DI is a typical compass circle with North at the top, East at the right, South at the bottom and West at the left. The compass however rotates around the Y axis, with East to the left of North and West to the right. On a number of occasions (I can remember at least 5, and I’m starting to wonder whether the ‘getting lost’ during the Brize transit lesson was a result of this too) I have mis-read the compass and consequently set the DI incorrectly. Must triple check this from now on. Runway 09 was active, so I was expecting to climb out, turn to the left following the circuit direction and then turn to my desired heading of 225 whilst downwind (but above circuit height). However, unusually (at least, it hasn’t happened to me before) I was given clearance to turn out to the right (“Aeros 53, with a turnout to the right, cleared take off runway 09”). Fair enough! So off we went, climbing out and at around 500ft I turned to the right. It felt a bit weird flying against the circuit direction and we were both doing extra lookout just-in-case. Soon I was heading 225 and doing my first gross error check against the map. So far so good. As I said, it’s pretty hard to get lost on this flight because of the river. I was handed over to Gloucester Approach, who gave us a basic service and asked us to “report at the bends in the river”. On reaching the bends, I reported and asked for a frequency change to Cardiff Approach. Change approved, and we switched to Cardiff. I had been practicing the expected radio calls in the car on the way to the airport (talking to myself!) in preparation. It’s the usual CARPACER stuff plus as Cardiff have ATIS you need to acknowledge the ATIS letter. They also ask you to report your aircraft type on first contact. 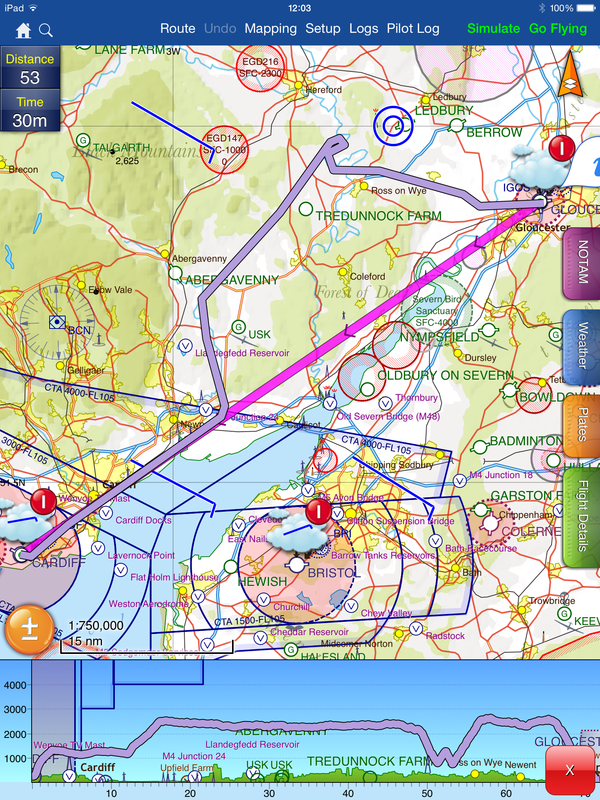 So “Cardiff Approach, Aeros 53, PA28 request join” then wait for “Pass your message” … “Aeros 53, PA28, inbound from Gloucester, overhead Chepstow altitude 2500 feet 1010, VFR with information Echo,estimate Cardiff time 55, request join”. When I made the actual radio call, I became distracted by something in the cockpit and only got as far as CARPA and then froze. Not sure why. Instructor took over and finished the call for me, phew. We were given a squawk, which we set and a basic service. A couple of minutes later, “Aeros 53, cleared to enter via published VFR Cardiff Docks arrival not above 1500 feet QNH 1010”. Readback done, acknowledged as correct and we were flying towards Cardiff Docks. I started our descent from 2500 to 1300 as we were approaching Cardiff Docks. By flying at 1300 we had some headroom incase I accidentally allowed us to climb. Flying over Cardiff Bay and seeing the Millennium Stadium and the marina at Penarth was lovely, such a beautiful view. I could see the Wenvoe TV mast ahead of us to our right. We were then told to join downwind left hand for runway 12. So I turned to the right and towards the airfield. St Athan airpot is 3nm from Cardiff and it’s very easy to confuse the two. My instructor had warned me about this in our pre-flight briefing so I was being extra careful to identify the correct airport. We had the DME tuned to Cardiff, the NDB tuned (so the ADF needle was pointing at Cardiff) and we also had the GPS set up for additional reassurance. I could see an airfield on the left and one on the right, so given our current position it had to be Cardiff on the left. Pre-landing checks complete, and turn on to left base. Approach was fairly non-eventful. This is the largest runway I have landed on so far and it felt a little weird to be able to stop in such a short amount of the available tarmac. We taxyed to the south side apron and parked up, went in to visit Aeros Cardiff and then popped upstairs to the Cambrian Bar for some lunch and a coke. After lunch, it was time to study the Published VFR Departure routes. I could expect the VFR Wenvoe departure, which is basically keeping to the East of the TV mast and exiting via Cardiff Docks. So essentially the opposite of our arrival. We weren’t sure whether we needed to ask for permission to start the engine, so we requested it and was told it was at our discretion. Better to be safe than sorry. We were then told to taxi to holding point Golf. Power checks complete, we reported ready for departure. Cleared for take-off via the published VFR Wenvoe departure route not above altitude 1,500 feet. Again, it felt strange being airborne and seeing so much runway still below and infront of us. We could probably have done a couple of touch and goes with the runaway ahead! Shortly after I turned to Cardiff Docks, we were asked to “Reset Squawk 3641”. We did and told them it had been done. They then asked us to try it again, as they were seeing us as 2641. Transponder cycled, set to 3641. Cardiff were still seeing us as 2641, very weird. Finally they asked us to switch the transponder off all together (“disable mode alpha”) which on hindsight sounds like a complicated way of “disable transponder” but hey, we obliged and they were happy. One to log in the techlog when we get back. Living in Usk, this is all local territory for me and it felt great to be able to see such wonderful view. 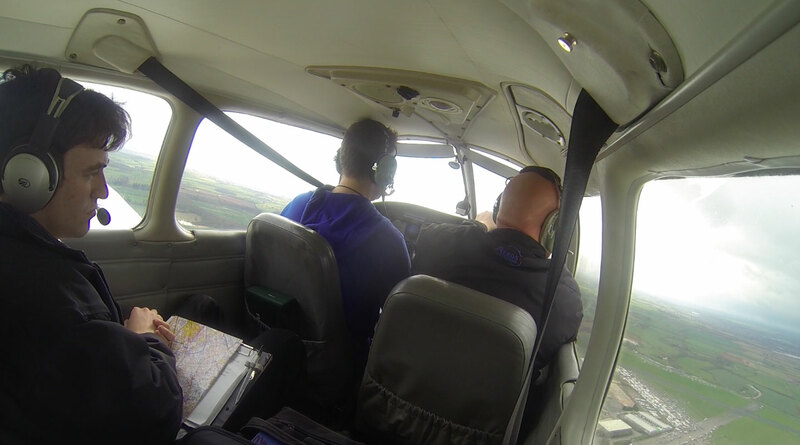 So that I could fly over Usk (and practice diversions!) I planned a diversion up the Usk valley. Heading changed, we requested frequency change to Gloucester and said goodbye to Cardiff. Driving from J24 to Usk takes around 12 – 15 minutes, but in the plane you can see Usk from J24 and you’re overhead it within 2 or 3 minutes. My instructor took some photos for me, and then marked another point on the map and asked me to divert to it. I drew a line, estimated the angle to be 45 degrees and measured the distance as 18nm. The wind was coming from our right, so a quick drift calc gave me a heading of 055. Estimating time took a bit more thought. At 100 knots, we fly 10 miles every 6 minutes (at any speed, simply divide by 10 to get miles per 6 minutes). Half it go get 5 miles every 3 minutes. So with an allowance for wind, I estimated between 9 and 10 minutes. First thing I learnt here was it’s pretty tricky trying to fly and draw lines on a map. I need to practice this so that I can confidently do it one handed. I could also use my feet to keep the wings level. Stopwatch started and it was time for some gross error checking. So far so good. After admiring the scenery, my instructor started fiddling with the throttle and – oh no – engine failure (practice!). I trimmed for 73 knots and turned downwind. We were at 1,900 but the terrain was around 500 feet so we didn’t have much height to work with. I picked a field and practiced my mayday call and what’s up checks. I then turned but got disorientated in the turn and ended up flying in the wrong direction and towards a different field. Oops. Need more practice. Finally we headed back towards Gloucester and asked for a straight in approach. We used the OBS mode on the GPS to visualise the approach line for runway 09 and I intercepted it at around 8 miles out. Gloucester was still busy (we were number 3) but they managed to approve our straight in approach, and we were shortly back on the ground. I really enjoyed today’s lesson. We covered a lot of stuff and things really seem to be clicking in to place now. Next lesson will be some more dual nav, in preparation for some solo nav and ultimately my qualifying cross country.